Order Golden Greens Bee Pollen - Organic from the Online Health Food Store UK. 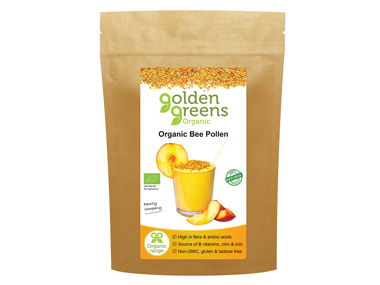 Buy Golden Greens Organic Bee Pollen - 100g and other quality Green Foods and Weight Management safely online in the UK. Organic bee pollen are high in fibre and b-vitamins. Use bee pollen on their own, sprinkle on yogurt or blend into smoothies. If you want to automatically receive an email when 'Bee Pollen - Organic' is back in stock, just leave your email address below. Organic Bee Pollen are from the unspoilt mountainous area of north western Spain, using natural, organic bee keeping methods to ensure the health of the bees and the purity of their pollen. Vitamin B1 in organic bee pollen contributes to the maintenance of of normal skin. Our UK Health Shop sells real Golden Greens and other Green Foods and Weight Management from top-quality brands safely online to customers throughout the United Kingdom in England, Wales, Scotland and Northern-Ireland. View more products on the Online Health Food Store from Golden Greens. Where to buy Golden Greens Bee Pollen - Organic safely online? Shop at the Online Health Food Store if you are wondering where you can buy Golden Greens Organic Bee Pollen - 100g safely online in the United Kingdom. Our Health Shop is located in the UK and our award-winning independent has been serving customers in England, Wales, Scotland and Northern-Ireland since 1976. You can buy our Green Foods and Weight Management online and we post out orders to any UK address. Bee Pollen - Organic - Golden Greens Organic Bee Pollen - 100g in Green Foods and Weight Management and Herbal Remedies, Tinctures & Supplements.